This breakthrough display technology delivers the smoothest, fastest and most breathtaking gaming imaginable. G-SYNC synchronizes the display refresh rates to the GPU in your GeForce GTX-powered PC, eliminating screen tearing and minimizing display stutter and input lag. Scenes appear instantly. Objects look sharper and more vibrant and gameplay is fluid and responsive, giving you a serious competitive edge. Support for HDMI output allows you to send both high-definition video and audio signals to an HDTV via a single cable. DisplayPort connectors support ultra-high-resolution panels (up to 2560 x 1600) -- which results in amazing image quality producing detailed photorealistic images. TurboFan Blade design is based on the turbojet engine which emphasizes on the power of thermal performance at maximum air flow and air pressure. 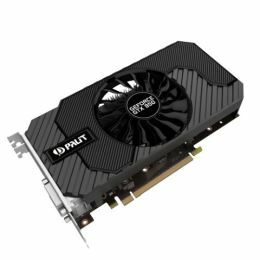 It can provide the best thermal solution to the graphics card.